This article is about the year 1995. For other uses, see 1995 (disambiguation). January 16 – An avalanche hits the village Súðavík in Iceland, killing 14 people. January 17 – The 6.9 Mw  Great Hanshin earthquake strikes the southern Hyōgo Prefecture with a maximum Shindo of VII, leaving 5,502–6,434 people dead, and 251,301–310,000 displaced. January 31 – Mexican peso crisis: U.S. President Bill Clinton invokes emergency powers, to extend a $20 billion loan to help Mexico avert financial collapse. 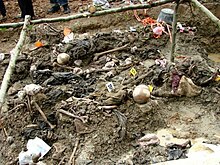 February 13 – 21 Bosnian Serb commanders are charged with genocide and crimes against humanity in the United Nations' International Criminal Tribunal for the former Yugoslavia, a tribunal on human rights violations during the Wars in the Balkans. Serkadji prison mutiny in Algeria: 4 guards and 96 prisoners are killed in a day and a half. February 25 – The Amazon Cooperation Treaty Organization (ACTO) (Organización del Tratado de Cooperación Amazónica [OTCA]) is formed. March 3 – United Nations Operation in Somalia II, the United Nations peacekeeping mission in Somalia, ends. March 20 – Sarin gas attack on the Tokyo subway: members of the Aum Shinrikyo religious cult release sarin gas on 5 subway trains in Tokyo, killing 13 and injuring 5,510. 11 of the principal activists are hanged in 2018. March 31 – TAROM Flight 371 from Bucharest to Brussels crashes shortly after take off killing all 60 people on board. April 7 – First Chechen War – Samashki massacre: Russian paramilitary troops begin a massacre of at least 250 civilians in Samashki, Chechnya. May 1 – Jacques Chirac is elected president of France. May 13 – The 6.6 Mw  Western Macedonia earthquake strikes northwestern Greece with a maximum Mercalli intensity of VIII (Severe), injuring 25 and causing $450 million in damage. May 14 – The Dalai Lama proclaims 6-year-old Gedhun Choekyi Nyima as the 11th reincarnation of the Panchen Lama. May 24 – AFC Ajax wins the UEFA Champions League at the Ernst Happel Stadium in Vienna by defeating A.C. Milan 1–0. May 28 – The 7.0 Mw  Neftegorsk earthquake strikes northern Sakhalin Island in Russia with a maximum Mercalli intensity of IX (Violent), leaving 1,989 people dead and 750 injured. June 24 – South Africa wins the Rugby World Cup. The Sampoong Department Store collapses in the Seocho-gu district of Seoul, South Korea, killing 502 and injuring 937. July 4 – Prime Minister of the United Kingdom John Major is re-elected as leader of the Conservative Party. July 21–26 – Third Taiwan Strait Crisis: The Chinese People's Liberation Army fires missiles into the waters north of Taiwan. August 4 – Croatian forces, with the cooperation of the ARBiH, launch Operation Storm against rebel Republic of Serbian Krajina forces, which subsequently ceases to exist as a political entity. September – The European Parliament elects the first European Ombudsman, Jacob Söderman, who takes up office in September 1995. September 27–28 – Bob Denard's mercenaries capture President Said Mohammed Djohor of the Comoros; the local army does not resist. November – The Indian government officially renames the city of Bombay, restoring the name Mumbai. The last signal is received from NASA's Pioneer 11 spacecraft. November 7 – Typhoon Angela leaves the Philippines and Vietnam devastated, with 882 deaths and US$315 million in damage. The typhoon was the strongest ever to strike the Philippines in 25 years, with wind speeds of 130 mph (210 km/h) and gusts of 180 mph (290 km/h). November 21 – The Dayton Agreement to end the Bosnian War is reached at Wright-Patterson Air Force Base near Dayton, Ohio (signed December 14). The 7.3 Mw  Gulf of Aqaba earthquake shakes the Sinai Peninsula and Saudi Arabia region with a maximum Mercalli intensity of VIII (Severe), killing eight and injuring 30, and generating a non-destructive tsunami. The first-ever full-length computer-animated feature film, Toy Story, is released by Pixar and Walt Disney Pictures. November 28 – 27 nations sign the Barcelona Treaty, creating the Union for the Mediterranean. November 30 – Operation Desert Storm officially ends. December 8 – 5-year-old Gyaincain Norbu is enthroned as the 11th reincarnation of the Panchen Lama at Tashilhunpo Monastery. December 14 – The Dayton Agreement is signed in Paris, officially ending the Bosnian War. American Airlines Flight 965 (Boeing 757) crashes into a mountain near Buga, Valle del Cauca, Colombia, after veering off its course en route to Cali, Colombia. Of the 164 people on board, 4 passengers survive. NATO begins peacekeeping in Bosnia. December 30 – The lowest ever United Kingdom temperature of −27.2 °C (−17.0 °F) is recorded at Altnaharra in the Scottish Highlands. This equals the record set at Braemar, Aberdeenshire in 1895 and 1982. ^ "Computer Communication Networks". washington.edu. ^ "Electronic Commerce in Private Purchasing". StudyMode. ^ "104 miners are crushed to death when an elevator carrying gold miners plunges to the bottom of a Vaal Reef mineshaft near Orkney". South African History Online. Retrieved August 27, 2014. ^ "Locomotive crushes 105 gold miners". The Independent. Retrieved August 27, 2014.